The lawsuit by Apple against Motorola Mobility, owned by Google, over royalties that Apple would have to pay to license some mobile phone patents by Motorola, has been tossed out by a federal judge in Wisconsin. Apple made a pre-trial statement that it would not pay any more than one dollar per phone in royalties, which caused the US judge to reject the case, because it showed that Apple may fail to adhere to an unfavorable resolution of the case. This lawsuit was thrown out Nov. 5, just a few hours before the trial was set to get started in the court of U.S. District Judge Barbara Crabb. According to a Reuters report, in this suit, Apple and Microsoft were accusing Google of asking for too high royalties for some of its standard issue patents. Motorola stated that it would license such patents on fair terms, as long as Motorola technology was adopted as an industry standard. This month, Crabb told both sides that she could decide what constitutes a ‘fair royalty’ for Motorola patents. This made Apple reveal that it would not consider that it is bound by the rate that Crabb sets if it is more than $1 per Apple phone. Apples stance in the matter seems to have forced Crabb’s hand, as she questioned if she had the legal authority to issue an advisory opinion. So, she dismissed the lawsuit, according to Reuters. Google, which recently launched this new disavowal tool, stated that it was pleased with the decision, and Apple did not comment. A legal brief that was filed after the ruling stated that Apple believed that the Judge had the authority to hear its claims. 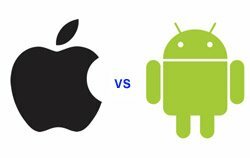 Apple and Google, which is facing more competition on the search engine front, continue to spar in courts around the globe as they fight over their mobile operating systems and various innovations. These battles have gotten worse, as the Android operating system by Google is becoming so much more popular, and is now in direct competition with the OS from Apple.